As mentioned in my last post this project is in maintenance stage for me (or as little work as I can get away with) so I can concentrate on other things. However... it's having a rebirth as a new project on Github! I'm a bit tentative about Github as previously I had exclusive distribution of the source via my blog but now it's easy for anybody to fork and improve. This is a double edge sword as others' improvements can be pushed back up stream and the project won't die - still it's letting go of my pride and joy! What still needs work for the source release? Over the next few weeks I hope to document the architecture and build instructions that I've simply not yet had the time to do - these will follow on a fixed blogger page and the project readme markdown respectively. There are areas that I'm not happy with (as with any project) that are downright ugly but the processing pipeline is sound and has had many refinements. Hopefully others will help improve the bad areas! So what else has changed? This release sees UI improvements for niggling issues like the image being too large and going off screen and a fix for serious bug in SCR export. 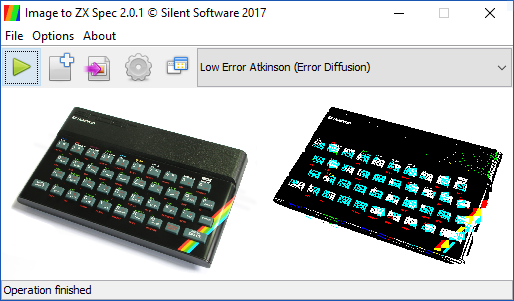 It also has improvements to Gigascreen rendering on a real Spectrum. Hi Benjamin, firstly thank you so much for this release - I used this program a few years ago and its nice to see this is still going through development. I've got one question - in your early 2009 video the slideshow would generate the image on to the paper area as it loaded in - is there a way for the loader to load from tape with each image and have it generate in in the same manner? I tried the different slideshow loaders (simple, buffered, gigascreen), but in each case it would load in the whole slideshow and only reload once it reaches the end of the slide. Hope this makes sense, and keep up the good work! Sorry I don't follow? :) The loading algorithm hasn't changed, could it be you are running this in an emulator and it's using a fast load? You're right! - the emulator (Fuse) was fast loading the slides, so the images loaded immediately. Sorry about the confusion and thank you. Great program. Brings back some great memories! I have been having trouble getting an image to load in an emulator slowly like your youtube video. It loads instantly each time. (I turned off fast load in Fuse). Dudes, your download link no longer works. Can't download it, says captcha v1 is no longer supported. I use this all the time, please fix!